Welcome to Santa Nana’s Holiday University, where you can experience a different point of view for holiday education. Today, families, clients, and the full Christmas community recognize the role and value women bring to a create a more complete holiday experience. 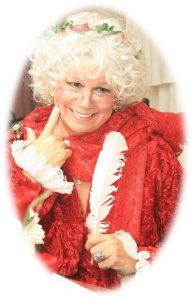 At Santa Nana’s Holiday University, our approach to learn, share, encourage, and connect with others, helps to prepare you to be a great solo performer, or a great partner. This two-day, traveling program is specially designed from a lady’s point of view and built on the legacy and vision of Santa Nana (Lucky Royse). Visit the Curriculum page to learn more, and we invite you to ask about scheduling a class in your location.